EDIT: Oh by the way, the area is about 7.3u², in case you were wondering. I apologise, but this is a very large image. But that's the work needed. EDIT: As Jacobly told me in SAX, I used the incorrect intersection point. Therefore, it should be 0.5 on the integrals rather than 0, giving a new final answer of 7.295. Wow, I didn't even notice that from 0 to 0.5, h(x)≥f(x), which means the area is a bit smaller, but that is not the point of the post...what you've posted is the calculus part of the problem, but I am focusing on the particular cubic equation, which seems very difficult to solve (I see you quickly glance over it and provide us with the solution (x³-x-3=0, x=1.6717)) did you somehow solve it and did not explain how, or did you just take the intersection point provided by your calculator and call it a day? There are also two other forms of this equation which spit out the two other roots, but I have not included those since this is the only real one and therefore, the only one of interest for this problem. Cardano's method is another method for solving cubics by hand; it's not more practical overall, but it is at least easy to remember compared to forms of the cubic formula. The first step can also be skipped if the equation is in the form x³+px+q! 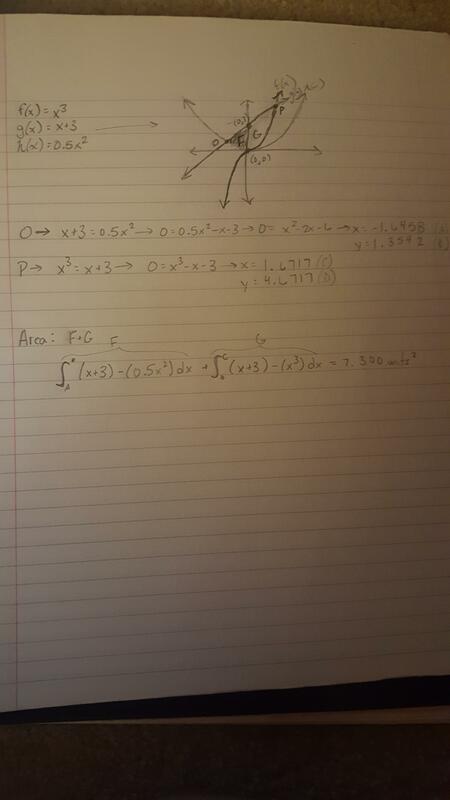 Using integrals is the way to go. There are 262 users online: 9 members and 253 guests. © Copyright 2000-2019 Cemetech & Christopher Mitchell :: Page Execution Time: 0.306390 seconds.